In Delhi NCR many jewellery shops have come up which are offering services like cash for jewellery. These are extremely popular among the customers of all genres. But our shop Cash For Gold Delhi NCR has carved a special place in this segment of jewellery buying. What makes us different from other players is that we are acknowledged for giving the highest price for your gold & silver ornaments in Delhi be it Chains, Bangles, Rings, Earrings, Anklets, Coins, Bars and Bracelets. The other area that makes us different as a gold buyer in Delhi is our evaluation process. We are using the latest modern instruments for gold & silver evaluation which gives accurate results. Within minutes we have the details about the purity of your gold & silver ornaments and pay accordingly. The other advantage of selling gold, silver and diamond to us is that we are giving hand to hand payment for your jewellery. Further, we are giving current market rates for your jewellery that is gold rate (10gm, 24K) Rs 32,000 Now Silver Rate Rs 42,000 (1Kg). Our company is also doing gold loan settlement which has helped many customers to come out of heavy loans which they were unable to pay. In case, the customer is unable to visit our shop, we can go for the home visit which is also a part of our services. Furthermore, the complete jewellery buying transaction is done in a safe close private office and details are not shared with any third party agency. 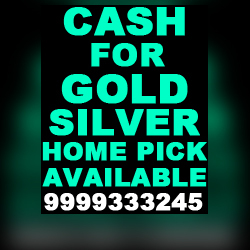 Moreover, our company cash for gold Delhi NCR has branches all over Delhi NCR and are known for doing transparent deals. All of these above features make us a top gold, silver and diamond buying organization in this sphere and the ultimate favourite among the customers. If you are planning to sell your jewellery be it in any condition do visit our shop for taking the best offer.